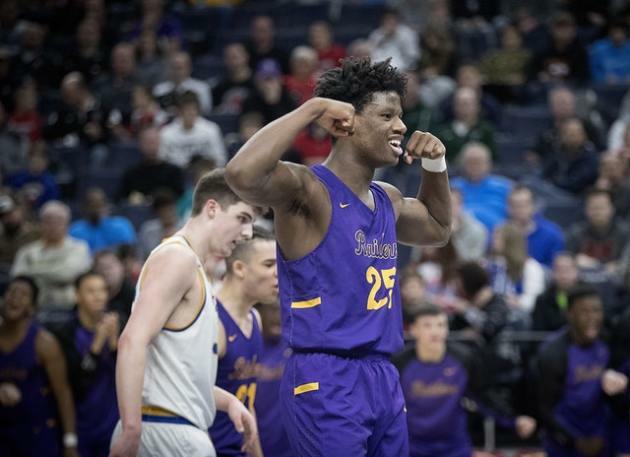 Gophers recruit Daniel Oturu: "I want to be able to turn my program around"
Daniel Oturu thought he could've helped the Gophers in the middle this season, but he was still finishing his senior year at Cretin-Derham Hall. His time in maroon and gold will come soon. The 6-foot-10 four-star center is fine waiting, because he's trying to lead the Raiders to their first state championship since 1993 on Saturday when they face Apple Valley at 8 p.m. at Target Center. 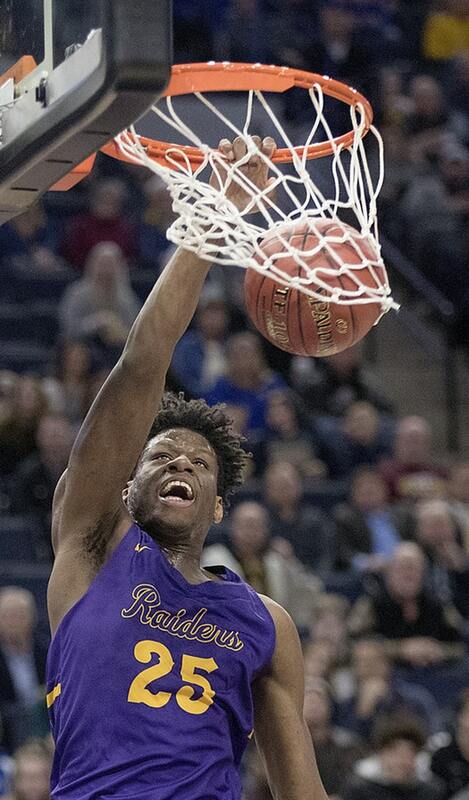 In a conversation with the Star Tribune earlier this season, Oturu talked about his final high school season, how he hopes to impact the Gophers as a freshman next season and more. Q: The first time Gophers fans saw you this season was when you injured your ankle in the first game. How relieved were you that it wasn't serious? A: It’s been great. That injury slowed me down the earlier part of the season. But I was able to recover real quick. Thankful to my trainer at my school. I just continued to do the stuff she told me and that helped me a lot. Just my teammates having their support really helped me, too. Made me want to get back even faster to help them out. Q: What do you think your role will be with the Gophers as a freshman next season? A: Something they struggled with (minus Reggie Lynch this season) is an inside presence. I feel like I can come in there with a defensive mentality and protect the rim and the paint like I’m doing right now. I feel like that will help us a lot next year. Q: So you think you could impact the game blocking shots like Lynch did when Minnesota made the NCAA tournament a year ago? A: I feel like I bring a different type of player. My mentality and the way I play the game is so different from the big men they have right now and what they did. I feel like I’m more of a scorer. I can score and also play defense and rebound. I feel like that will help us out next year. Q: Richard Pitino and the Gophers had a rough season (15-17 record). How did you look at their struggles this year? A: It’s a process and you can continue to grow off of something that was already started (the previous season before the injuries). They got a talented group of guys coming back. I will take them over anybody. I love watching those dudes play. They play hard every night and they just want to win. That’s the most important thing. You want to be around the same type of people who want what you want and that’s to ultimately win. That’s how my high school team is right now. We realize we’re all invidually talented players, but we all come together in unison. In the locker room, we all want to win and we put anybody before ourselves. Q: How much growth physically are you expecting once you get to college? A: I feel like I have a long way to go. By this time next year, I’ll be in a different weight class and have a lot more pounds on me. Overall, I feel like I’ll be a better player. I’m 6-10 1/2 (with shoes). So I feel the weight that I need to correlate with my body would be around 235-240. I feel like I can be 235 at the start of next season with the weight training at the U and eating right. Q: What was your feeling being selected as a finalist for the Minnesota Mr. Basketball Award? A: It was a blessing. Anything I do I got to give thanks to the Lord. Without Jesus Christ I wouldn’t be here. It’s truly a blessing. I feel like the way I’m leading my team and the success we’re having right now, I feel like I’m a leading candidate to win it. But I just want to do what I can to help our team win. That’s all that matters to me. The one goal is to win a state title before I graduate. This is the last chance I got. So I have to go out strong. Q: You've been dominant down low all season, but did you see it coming that senior frontcourt teammate Sy Chatman could have a breakout year? A: Sy individually has been playing at a really high level. I feel like he’s the X-factor to our team. We have a point guard (Ryan Larson) and a big man, but I think we have a bunch of glue guys. We have everything. Sy playing at the level he’s playing boosts us to another level. Q: Do you ever look at college basketball and get excited seeing players you competed against at the AAU level? A: (Wisconsin freshman) Nate Reuvers was a great basketball player and had high IQ. Nice touch. Playing against him last year twice was really cool (at Lakeville North). Now he’s in the same conference I will be in. He’s going to a good school in Wisconsin. They’re struggling right now too, but they'll turn it around. I love watching Brad (Davison). It’s cool seeing Theo John from Marquette do well. Big guys who I’ve gone up against. Seeing that gives me even more confidence that going to the U next year, I can do well. Everytime I step on the basketball court, I treat it like I’m the best player on the court. That’s my mentality always. Not in a cocky way, but in a confidence way. I got to play at a high level every day. Q: Who was the best player you played against that's in college right now? A: During the summer playing against (Duke freshman) Marvin Bagley III. He’s in the race for player of the year in college basketball and I just played against him six months ago. It’s crazy. Just seeing these people having so much success at the next level is getting me even more excited. I want to just show everybody what I can do and help my team win. I want to be an X-factor. I want to be able to turn my program around.